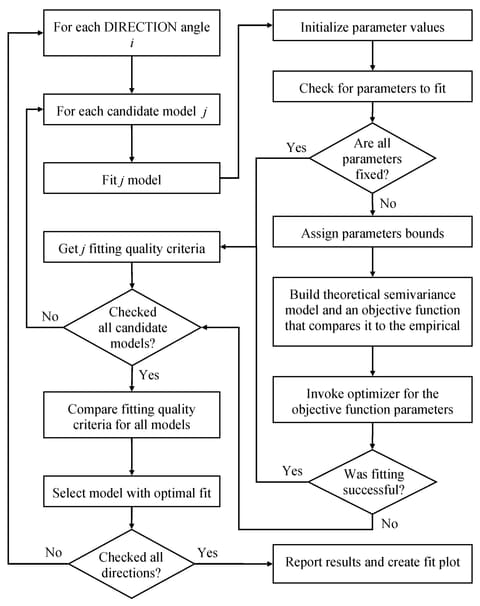 You can choose between two approaches to select a theoretical semivariogram model and fit the empirical semivariance. The first one is manual fitting, in which a theoretical semivariogram model is selected based on visual inspection of the empirical semivariogram. For example, see Hohn (1988, p. 25) and comments from defendants of this approach in Olea (1999, p. 82). The second approach is to perform model fitting in an automated manner. For this task you can use methods such as least squares, maximum likelihood, and robust methods (Cressie; 1993, section 2.6). where is the number of pairs of points in the th distance lag. PROC VARIOGRAM relies on nonlinear optimization to minimize the least squares objective function . The outcome is the model that best fits the empirical semivariogram according to your criteria. The fitting process flow is displayed in Figure 98.25. Goovaerts (1997, section 4.2.4) suggests that fitting a theoretical model should aim to capture the major spatial features. An accurate fit is desirable, but overfitting does not offer advantages, because you might find yourself trying to model possibly spurious details of the empirical semivariogram. At the same time, it is important to describe the correlation behavior accurately near the semivariogram origin. As pointed out by Chilès and Delfiner (1999, pp. 104–105), a poor description of spatial continuity at small lags can lead to loss of optimality in kriging predictions and erroneous reproduction of the variability in conditional simulations.